President Rickles insulted members of his audience during last night’s state of the union speech. 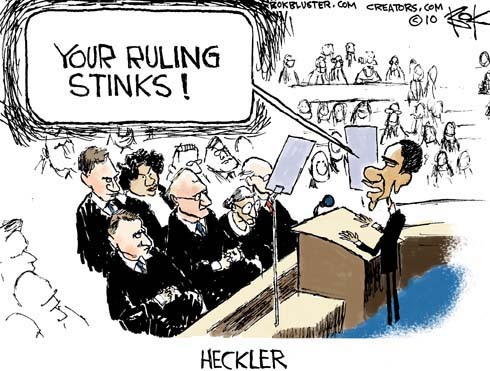 He criticized the Supreme Court, while some justices sat directly in front of him, for its ruling in favor of free speech in the Citizens United v. FEC case. Here’s a link to the Washington Post with a video clip of the moment, including Alito’s response. Here’s Jack Tapper at ABC giving a historian’s perspective. I realize you are a staunch conservative, but can’t you see that unlimited spending from corporations is not a good thing? This ruling is not about free speech, it is about being able to buy politicians who are already corrupt. This ruling is a setback for real individuals, and I do not consider a corporation to be an individual. Obama is telling them to their face, not hiding behind rhetoric or political doubletalk. When Cheney did that you praised him. What’s different here? Stay conservative, but get rid of the double standard. I guess that there’s no reason to write the essay topic by own efforts! For me, it would be more comfortable to buy the good term paper at the paper writing service, because that saves free time.